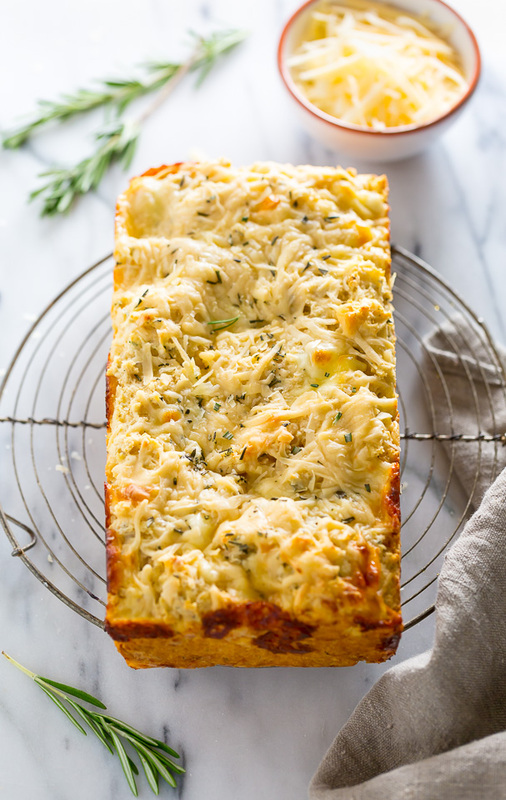 Ready in less than an hour, this Herbed Ricotta Cheesy Bread is sure to become a fast favorite! 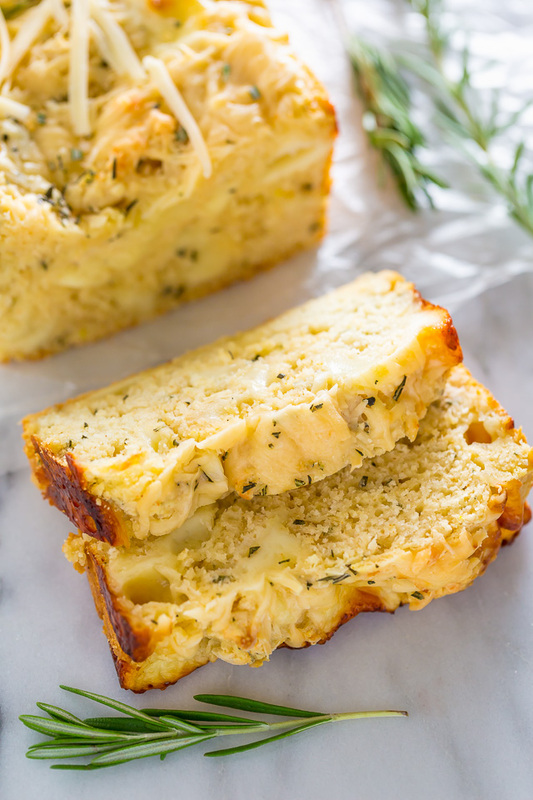 New day, new (savory) recipe for you! And because I know no one likes spending their free time washing dishes, I developed this recipe to use only one bowl! Can I hear an amen to that?! Although this may seem odd, you’re not going to line your loaf pan with foil or parchment paper. Instead, you’ll spray the pan generously with non-stick baking spray, then sprinkle a half cup of Parmesan cheese on the bottom of the pan. From there we add our batter, and top it all off with more cheese. Like I said earlier: it’s a cheese lover’s paradise! While we’re on the topic of the batter, you should know it’s VERY thick. And somehow almost foamy in texture. I’m telling you this for two reasons: 1) so you don’t panic when you see how thick it is and 2) so you don’t over mix the batter! Be very gentle when you’re folding the wet ingredients into the dry ones, and stir until just combined. Because I LOVE the flavor it adds, I used browned butter in this recipe. It only takes a few minutes but adds SO much oomph to the finished product. Promise me you won’t skip it? I baked this quick bread in a 10″ loaf pan, but you may use a 9″ loaf pan. However you will likely need to add 4 or 5 minutes onto the bake time. Don’t over bake! Remember all ovens are different, so your loaf may be ready as early as 40 minutes or take as long as an hour to bake. Just keep an eye on it! 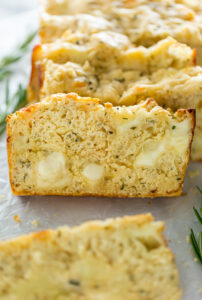 One bowl Herbed Ricotta Cheesy Bread… ready in less than an hour… does is get any better than that?! 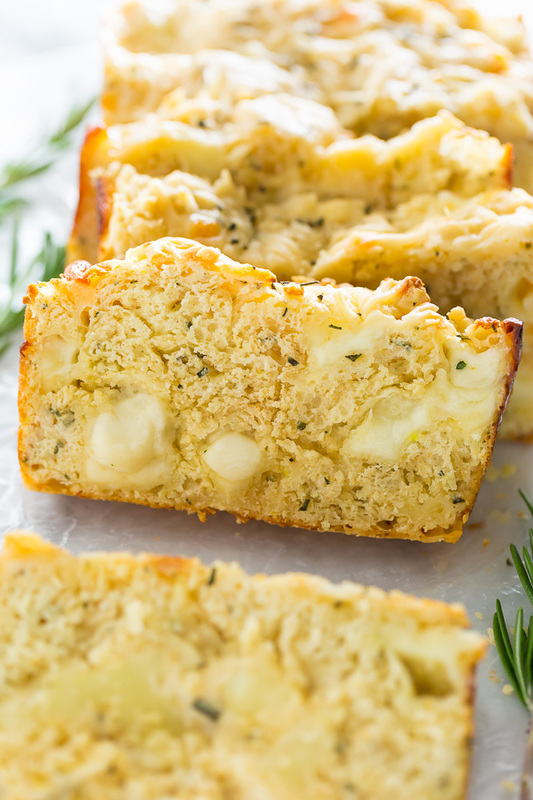 Loaded with fresh rosemary, ricotta cheese, mozzarella, and Parmesan, this quick bread is bursting with flavor! Perfect with soup, chili, or just a pat of butter. Place the butter in a small sauce pan over medium-high heat and cook for about 3 minutes – stirring almost constantly – until the butter has turned an amber gold/brown and smells slightly nutty. Remove from heat and set aside until needed. Spray a 9 OR 10" loaf pan with non-stick baking spray. Sprinkle half of the Parmesan cheese on the bottom of the pan and set aside. In a large bowl add the flour, baking powder, rosemary, cayenne pepper, black pepper, salt, and brown sugar; mix well to combine. Add in the cubed mozzarella and toss with your hands, making sure each cube gets coated in the flour mixture. Make a well in the center of the flour. Add in the milk, ricotta cheese, and egg. Use a fork to lightly whisk the wet ingredients together, then use a rubber spatula to gently fold the wet ingredients into the dry ones. Stop folding when you can still see just a little flour. It's important not to over mix here! fold in the browned butter until just combined. Pour the batter into the prepared pan and smooth the top. Sprinkle with remaining Parmesan cheese, and bake for 45 to 55 minutes, or until a toothpick inserted in the center comes out clean. Cool in the pan for 10 minutes, then invert onto a plate, then flip it back (right side up) onto a cooling rack and cool for at least 30 minutes before slicing. This bread actually tastes better the longer you let it cool. Whole loaves may be frozen. To store, wrap tightly in saran wrap and keep at room temperature for up to 48 hours. What temp do u cook this bread on?